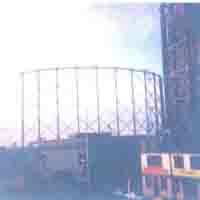 SEGAS have decided to mark the centenary of the largest gas holder in Europe by demolishing it – last week I was once again caught trespassing on East Greenwich Gasworks – and people keep saying to me ‘but, why is it so important?’. 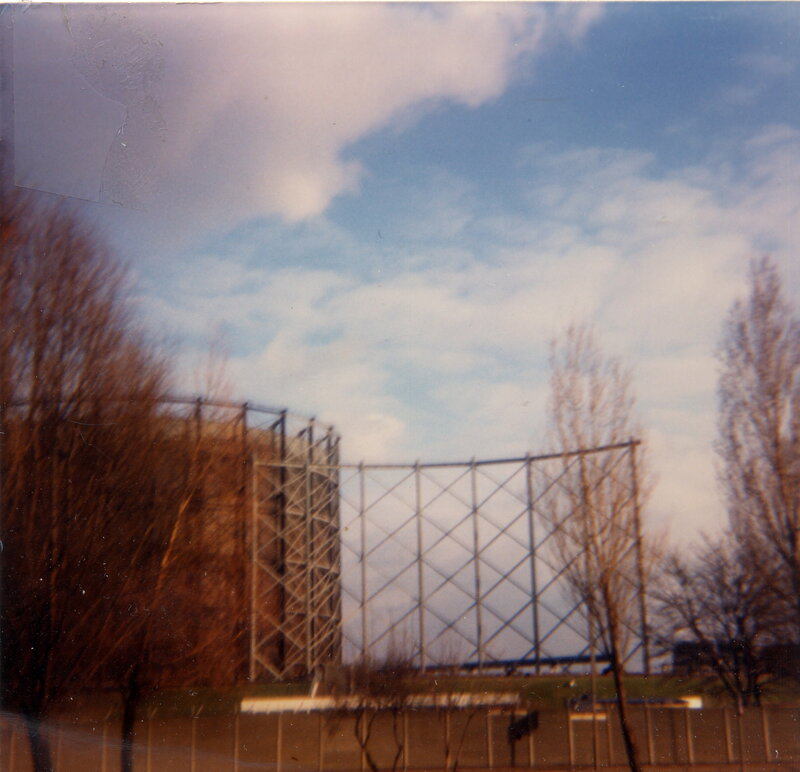 East Greenwich No.2 Gasholder was the biggest gasholder, the expression of what the South Met. 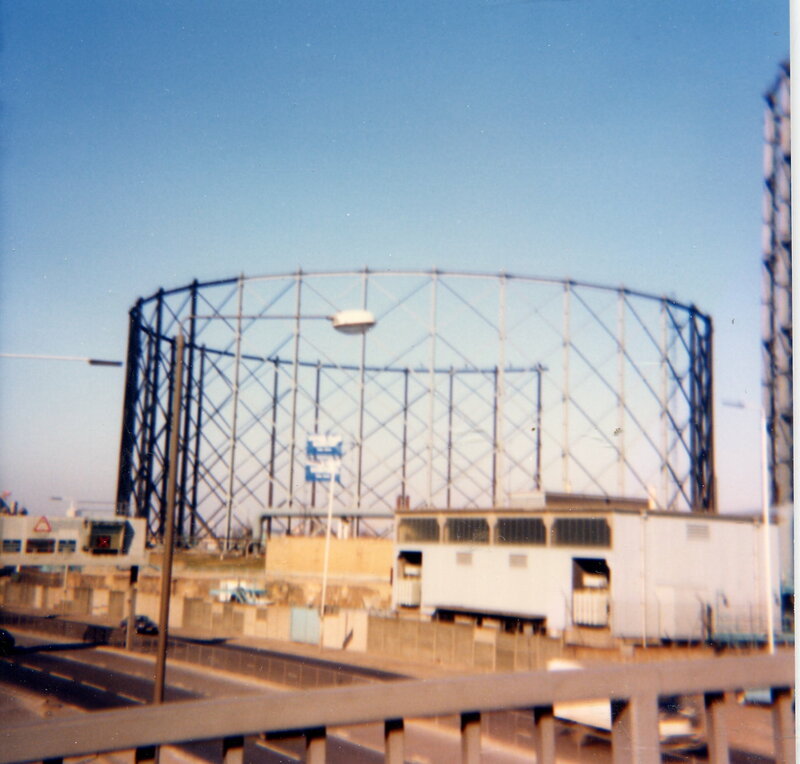 Gas Company was trying to do at East Greenwich – to show the world that they were the leading gas company – and to make that fact quite clearly visible in Beckton on the other side of the river. The works was built in the early l880s embodying all that was most innovative in gas. There were however problems with the marshy ground and No.l holder (the one thats now still full of gas) had proved very expensive to build. For that reason it was decided not to built proper foundations for No.2. The ground was excavated as far as the water table and then the base for the telescopic holder was built up out of the ground. This structure is now clearly visible as the holder is demolished. There was considered to be a risk that the holder would tilt in this shallow base and for this reason a great deal of research was done into the structure of the guide framing. In addition a great deal of thought was given to the company on the effect of extraordinary wind pressures on the holder’s surface. The eventual guide framing was constructed to what is described as a combination of the English radial and French tangental systems. An additional two ‘flying lifts’ projected form the top of the holder when it was full. The finished holder would take l2m. cubic feet of gas. At the time it was the biggest in the world. Its enormous size was computed to be a very cheap way of storing gas. Worked out on the basis of its construction cost, and things like the cost of rates on the land used the price of gas storage was dramatically cut. An additional bonus was that very large amounts of gas could be stored over weekends and holiday periods thus cutting the amount that had to be paid in wages. The company had a strong ideological commitment to giving its workforce time off on Sundays for religious reasons – and it must be remembered that by the end of the decade the Gas Workers Union had organised partly round the abolition of Sunday working. explosion ruptured it and 8 million cubic feet of gas extant in Greenwich – Charlie Wellard (whose biography is in Woodlands Local History Library} asked his mother if it was the end of the world. An old lady down the road from me says she saw a red hot girder blown across the river and pierce the gas holder. After this the two ‘flying lifts’ were removed and the holder assumed its final shape – it has always looked smaller than its (actually smaller) neighbour. Rush down to East Greenwich to see the last few girders before it is too late. They are pulling the tank out first from the back. I stand to be corrected by people who know more than me on any fact in this – but (to reassure SEGAS)all information comes from printed sources (Journal of Gas Lighting, Transactions of the Gas Institute and Copartnership Journal). Next Next post: FROM STAITHES TO GASWORKS IN A COMPANY’S SHIP.